Suffering from protein boredom? Shake things up—literally—with these creative additions! It's probably not a surprise that combining exercise and protein is a great strategy for getting the most out of your workout routine. Weight lifting your thing? Protein can help build muscle and support recovery. Using exercise to help with weight management or weight loss? Protein will help you feel fuller and spare your hard-earned muscle mass from breakdown. Exercise wearing you down? Protein can help support your immune system and overall health. For many people, protein means boiled chicken breast or a quick shake concoction of protein powder and water on the walk or ride home from the gym. That's fine—until you feel like you have chicken breasts and protein shakes coming out of your ears. If you are indeed sick of the same-old routine and feel like you might need some inspiration, explore these different protein categories. Dairy is a great source of complete protein. 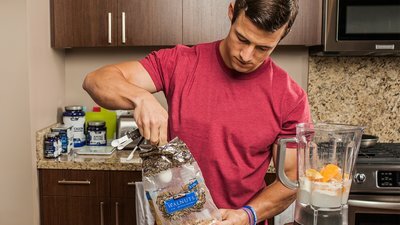 It also provides a unique blend of different proteins, which makes it a great addition to any smoothie, whether you're looking to pack on size or lose some pounds. Aside from the nutritional perks they provide, dairy items provide an unmatchable level of creaminess and viscosity that enhance your final protein creation. Consider cow's milk, soy milk, or yogurt (regular or Greek yogurt) to pump up the protein content and flavor of your shake! To maximize the amount of flavonoids in your shake, choose a cocoa powder that's at least 60 percent cocoa. Unsweetened cocoa powder is a great option, too, since it boasts a mere 12 calories per tablespoon. Add a spoonful (or two) of your favorite nut butter to the mix, or elevate the texture by adding your favorite nut or seed. Nut butters are a great source of healthy fats. Consider peanut, almond, or cashew butter, and almonds, walnuts, and pecans. If you're striving to pack on size, adding calorie-dense, healthy fats is an easy way to sneak in extra calories. For those looking to maximize flavor while minimizing the calorie content of the smoothie, consider a low-calorie powdered nut butter. Looking for a way to incorporate more whole grains into your diet? Consider grinding up oats and adding them to your shake! Trust me, it will give your shake a smooth consistency while delivering extra fiber, B vitamins, and other nutrients. If you're looking for a way to minimize the texture of the oats, consider grinding the oats in your blender first, and then add your remaining favorite ingredients. Oats are a great add-on for anyone looking to gain size, because a single cup of condensed, powdered oats provides 300 calories! There are plenty of premade protein shakes readily available that boast 20 or more grams of protein and a better taste than your whey-water combination. Consider stocking up on a few of your favorites and keeping them on hand for when life gets crazy (which may be close to every day for most). There are a number of high-protein foods out there, so don't feel as if you need to live on protein shakes alone. Consider dairy, animal meats, fish, seafood, soy, quinoa, beans, or a complementary pairing of grains and nuts to reap the benefits protein has to offer. Li, P., Yin, Y. L., Li, D., Kim, S. W., & Wu, G. (2007). Amino acids and immune function. British Journal of Nutrition, 98(02), 237-252. Flynn, A. (2003). The role of dietary calcium in bone health. Proceedings of the Nutrition Society, 62(04), 851-858. Berchtold, M. W., Brinkmeier, H., & Müntener, M. (2000). Calcium ion in skeletal muscle: its crucial role for muscle function, plasticity, and disease. Physiological Reviews, 80(3), 1215-1265. Sandstrom, O., Lonnerdal, B., Graverholt, G. & Hernell, O. (2008). Effects of alpha-lactalbumin-enriched formula containing different concentrations of glycomacropeptide on infant nutrition. American Journal of Clinical Nutrition, 87(4), 91-98. Hernandez-Ledesma, B., Recio, I. & Amigo, L. (2008). b-Lactoglobulin as source of bioactive peptides. Amino Acids, 35, 257-265. Kris-Etherton, P. M., & Keen, C. L. (2002). Evidence that the antioxidant flavonoids in tea and cocoa are beneficial for cardiovascular health. Current Opinion in Lipidology, 13(1), 41-49. Steinberg, F. M., Bearden, M. M., & Keen, C. L. (2003). Cocoa and chocolate flavonoids: implications for cardiovascular health. Journal of the American Dietetic Association, 103(2), 215-223.